Hyderabad, Telangana, India (21 July 2014) – An international partnership across India, Africa and the USA has formed the ‘One Agriculture-One Science: A Global Education Consortium’ initiative aimed at revitalizing global agricultural education, capacity building and technology transfer. This has been made possible with the collaboration of the International Crops Research Institute for the Semi-Arid Tropics (ICRISAT) and top universities from all these continents. ‘One Agriculture-One Science’ is a consortium of agricultural education institutes, research organizations and other related agencies specifically focusing on addressing changes and adaptations required for agricultural education to better contribute and more effectively impact development goals, particularly the attainment of food and nutritional security and sustainable agricultural production in developing countries. ‘One Agriculture-One Science’ will bring various disciplines in agricultural education such as crop, livestock, fisheries, natural resource management, etc. under one roof by providing a common platform to address pressing global food security, accessibility and affordability challenges. Through partnerships and knowledge networks, participating institutions shall offer short courses, student scholarship programs and collaborative research opportunities addressing these challenges. 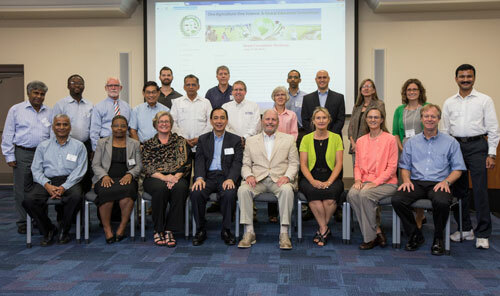 Global collaborative partners from a wide range of interdisciplinary expertise and experience gathered for the launch of the initiative in an expert consultation workshop jointly organized by ICRISAT, the University of Florida (UF), Michigan State University and Iowa State University, held at UF, Gainesville, Florida, USA on 17-18 July 2014. The launch was attended by select experts from land grant state universities in the USA, the Indian Council of Agricultural Research (ICAR), the African Green Revolution Alliance (AGRA), the Regional University Forum for Capacity Building in Agriculture (RUFORUM, a consortium of 42 universities in 19 countries in Africa), US Department of Agriculture, US Agency for International Development, and CGIAR centers. ‘One Agriculture-One Science’ is a common platform to comprehensively address gaps in agricultural education with the latest advancements in technology and knowledge flow strategies,” said Dr William D. Dar, Director General, ICRISAT, at the launch of the initiative. “The task of revitalizing global agricultural education requires all of us to work together in developing an educational and capacity building road map focused on how we can better contribute to global food and nutritional security through a global education consortium for development,” Dr Dar continued. “As a land grant university engaged worldwide, we at UF’s Institute of Food and Agricultural Sciences (IFAS) know that our relationships with our international partners are reciprocal, that sometimes we experience reverse technology transfer,” said Dr Jack Payne, Senior Vice-President, UF, Gainesville. Beyond UF-IFAS Global, we’ve got ambitious plans for addressing perhaps the grandest challenge of our time: How to feed a projected 9.2 billion people by 2050 and do it in a safe, secure, nutritious and sustainable way and that our collaborations yield more discovery and contribute to the global mission,” emphasized Dr Payne. “The ‘One Agriculture-One Science’ will see the formation of a consortium of international educators including select universities in the USA, international and regional organizations, and universities in interested regions, especially from the BRICS countries (Brazil, Russia, India, China, and South Africa),” said Dr K Ramesh Reddy, Graduate Research Professor and Chair of Soil and Water Science Department, UF-IFAS. “The initiative is a strategic coalition of partners anchored on innovative knowledge networks, public-private partnerships, and novel educational approaches to revitalize global agricultural education to better contribute to food and nutritional security,” stressed Dr Dileepkumar Guntuku, Global Leader, Knowledge Sharing and Innovation, ICRISAT. A partnership framework under the ‘One Agriculture-One Science’ umbrella was developed during the workshop with all participating partners expressing commitment to the joint initiative. A dedicated website for this initiative was also launched (www.oneagriculture.org).